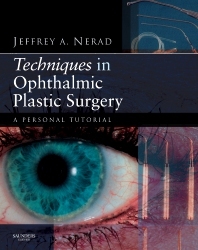 Techniques in Ophthalmic Plastic Surgery is a richly illustrated, step-by-step guide to oculoplastic surgery, covering everything from the basics to the most recent advances. Jeffrey A. Nerad, MD provides a personal tutorial approach detailing both procedural and management aspects of practice. Includes the latest in cosmetic procedures and detailed photographs and surgical line drawings—most of which are in full color. This is the essential text for those learning oculoplastic surgery and will bring even the most experienced practitioner up to date with current practice and procedures. Develop a strong foundation in this complex field and apply surgical techniques to frequently encountered abnormalities and aesthetic facial enhancement. Keep this outstanding text close by for a fast, practical, and authoritative reference. Features more than 760 illustrations—over 700 in full color—from pre- and post-operative photographs to step-by-step surgical line drawings, that provide you with a nuanced visual understanding. Presents an expert’s perspective on the most frequently performed oculoplastic surgical procedures for authoritative and trusted guidance. Provides the indications for the use of each procedure along with advice on the management of complications so you have a structured resource with both procedural and management information. Devotes an entire chapter to aesthetic surgery of the face providing extensive coverage of this important and rapidly developing area in oculoplastic surgery.